Click to watch the presentation film. The OLV Hospital is located across three campuses (Aalst – Ninove and Asse). 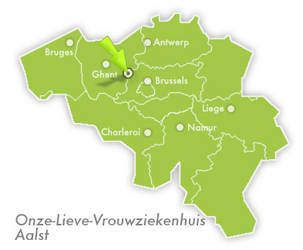 The main campus is located in the city of Aalst between Ghent and Brussels. A highly skilled team of approximately 270 physicians and 1,000 nurses are giving all their patients Top Care according the highest standards in Healthcare. High-quality care is the top priority and as such we continually invest in new technology and equipment. The management of the hospital encourages and motivates the staff to invest in further education and training opportunities. The dedication of the OLV Hospital to excellence has made them one of the best-known hospitals in Belgium. Through its long-standing tradition of research and innovation, the OLV Hospital has gained an outstanding national and international reputation, primarily in the fields of cardiology, cardiovascular surgery, urology, general surgery and neurological surgery. The hospital is extremely active in teaching, this at a national and international level. Every year a number of scientific fellows and trainees are given the opportunity to work with us and develop their skills and knowledge. A Phase 1 Research Centre is linked to the hospital, Research is conducted and publications produced in several medical disciplines with the support of study nurses. The hospital is also the home base of the OLV Robotic Surgery Institute (ORSI) dedicated to provide unique training, education, data management, expertise and Research & Development in this field to all those who are involved in Robotic Surgery worldwide. A new 40,000-m2 wing on the Aalst campus was inaugurated in 2009, thereby enabling the hospital to cope more easily with the rising number of short-stay and day-care patients. Ongoing investment also means that the doctors have access to the very latest technology (Brain lab, Phlebo lab, Robotic surgery, Medical imaging, etc.). The OLV Hospital is situated at 20 kms of Brussels' National Airport. There is a railway station in Aalst, with easy access by bus to the hospital (or 10 minutes' walk). The E40 motorway is also nearby. Leave exit 19 and follow the direction of Aalst.